A still from Shanghai Express (1932). 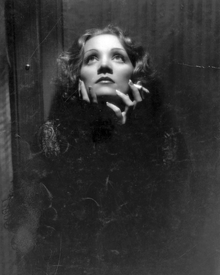 Josef von Sternberg used butterfly lighting to enhance Dietrich's features. Marlene Dietrich was a German-American actress. In the 1920s, she acted on the Berlin stage and in silent films, making her film debut in 1922. She was propelled to international fame by director Josef von Sternberg, who cast her as Lola-Lola in The Blue Angel (1930). The film's commercial success brought her a contract with Paramount Pictures in the United States. Paramount sought to market Dietrich as a German answer to Metro-Goldwyn-Mayer's Swedish sensation, Greta Garbo. Her first American film, Morocco (1930), directed by Sternberg, earned Dietrich her only Oscar nomination. She would appear in several other films directed by Sternberg, including Dishonored (1931), Blonde Venus (1932), and Shanghai Express (1932). Dietrich and Sternberg's last two film collaborations, The Scarlet Empress (1934) and The Devil Is a Woman (1935)—the most styled of their collaborations—were their least successful at the box office. Her first sound film without Sternberg was 1933's The Song of Songs, directed by Rouben Mamoulian, although she and Sternberg would later work together another two times. But without Sternberg, Dietrich—along with Fred Astaire, Joan Crawford, Mae West, Greta Garbo, Katharine Hepburn, Dolores del Río and others—was labeled "box office poison" after the movie Knight Without Armour (1937) proved an expensive box office failure. In 1939, however, her stardom was revived when she played a cowboy saloon girl in the light-hearted western Destry Rides Again opposite James Stewart, singing "See What the Boys in the Back Room Will Have". While Dietrich arguably never fully regained her former screen glory, she continued performing in movies, including appearances for such distinguished directors as Billy Wilder, Alfred Hitchcock, and Orson Welles, in successful films that included A Foreign Affair (1948), Stage Fright (1950), Witness for the Prosecution (1957), Touch of Evil (1958), and Judgment at Nuremberg (1961). Her final film appearance was as herself in the 1984 documentary, Marlene. In 1999, the American Film Institute named Dietrich as the ninth-greatest female star of classic Hollywood cinema. 1928 Die gluckliche Mutter Dietrich Biographer Steven Bach notes that the release of this film has not been verified. 1935 The Fashion Side of Hollywood Promotional short film publicizing costumes designed by Travis Banton. Cirque d'hiver (Paris, 9 March 1963): Cameo as "Garcon de Piste"
I Wish You Love (An Evening with Marlene Dietrich) (London, 23 & 24 November 1972): Concert TV Special, with orchestra conducted by Stan Freeman. 1962 Judgment at Nuremberg Won David di Donatello Awards For her performance. This page was last edited on 13 January 2019, at 03:07 (UTC).